For the first time, scientists at Tokyo Institute of Technology have determined that the Curie temperature (the point above which a material stops being ferroelectric due to crystal re-structuring) of an 'orthorhombic' crystal of hafnium oxide is 450°C. Image: Tokyo Institute of Technology. 'Ferroelectric' materials can switch between different states of electrical polarization in response to an external electric field. This flexibility means they show promise for use in many applications, such as electronic devices and computer memory. Current ferroelectric materials are highly valued for their thermal and chemical stability and rapid electro-mechanical responses, but creating a material that is scalable down to the tiny sizes needed for technologies like silicon-based semiconductors (Si-based CMOS) has proved challenging. Now, Hiroshi Funakubo and his co-workers at the Tokyo Institute of Technology, in collaboration with other researchers across Japan, have conducted the first experiments to determine the ferroelectric properties of an inorganic compound called hafnium oxide (HfO2). Crucially, they have found that the crystal structure of HfO2 allows it to be deposited as ultra-thin films, potentially making it invaluable for use in next-generation technologies. They report this work in a paper in Scientific Reports. The ferroelectric properties of a crystalline material stem from its crystal shape and structure. While a number of ferroelectric materials are already used in different applications, their crystal structure does not allow them to be scaled down to ultra-thin films for use in miniaturized devices. Using first principle calculations, scientists had already predicted that an 'orthorhombic' crystal of HfO2 would probably exhibit ferroelectricity. However, no research team had confirmed and examined these predictions through experiments. 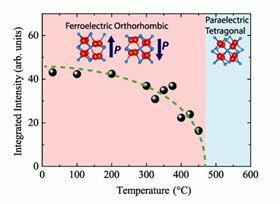 So Funakubo and his co-workers set out to pinpoint the material's spontaneous polarization and its Curie temperature (the point above which a material stops being ferroelectric due to crystal re-structuring). To do this, they needed to grow the crystal as a thin film on a substrate, using a process known as epitaxy, which would give them well-defined data on an atomic scale. The researchers found that one particular epitaxial film, labelled YHO-7, exhibited ferroelectricity with a spontaneous polarization of 45μC/cm and a Curie temperature of 450 °C, confirming the predictions made using first principle calculations. From a scientific and industrial point of view, a Curie temperature of 450°C is of great interest, because it means the material could fulfill functions for future technologies. In contrast to many existing ferroelectric materials, the new thin film exhibits compatibility with Si-based CMOS and is robust in miniature forms. Funakubo and his co-workers are hopeful that their new thin film ferroelectric material will also have applications in novel random-access memory and transistors, along with quantum computing.